When talking about developing software, we often first talk about what needs to be created, what it should look like and how it should be created. All very important points, but what makes one application or app more successful than the other? I have seen very successful applications, of which the architecture and state-of-the-art technology are questionable at best. I have also seen unsuccessful applications with a challenging user interaction and a near flawless architecture. Why is that the case? Why does the one store where everything seems to be happening by coincidence sell better than the store that does everything right? I believe that, to a certain extent, it doesn't matter what an application can do. It's about whether the users, or stakeholders, believe in the concept. I believe that stakeholder value is key! 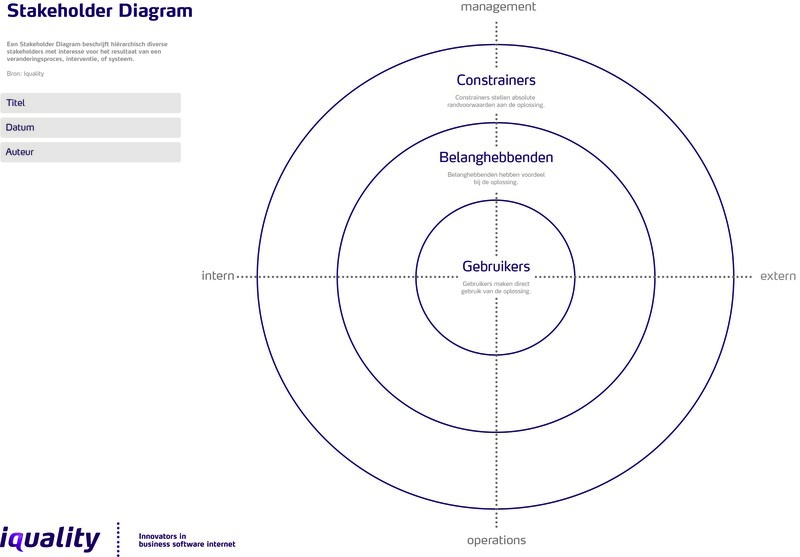 The diagram offers you the possibility to identify your stakeholders. Additionally, it's about being aware of who you're dealing with and about insight into the extent to which the stakeholders have power or influence over your organisation. Keep it simple at first, but do give it significant consideration. Starting a new company is accompanied by great uncertainty. There is an idea, a vision, a belief, but that does not put you in the black. A new company should find an answer to the question who exactly its customers are and how they are able to deliver new value. The same applies to customised work, software productions, apps, websites or web application. A global, functional and technical design only takes away the question about what should be made. But, in most cases, it is based on assumptions and the question of how this will provide stakeholder value is not answered. Requirements then?, usually not. Yet, this is essential. Measuring stakeholder value is also essential during the life phase of an application. This demands an approach where stakeholders are more central, where context is important and where assumptions are named and testing occurs as soon as possible. Do you know the stakeholders of your applications and can you make the value demonstrable? I would like to conclude with one comforting thought. We too - managers and IT - are stakeholders! Helping with software development via the Agile/Scrum method. Direct collaboration and room for innovation. A method to determine characteristics and needs of users.